Alou Fané and Daouda 'Flani' Sangaré were born in the Ganadugu district of the Sikasso or Kénédugu region of Mali. In the traditional caste system the Fané family is a family of blacksmiths, while Sangaré is a Peul or Fula family. As such they are linked by tradition, as a Peul is the only one who can joke with a blacksmith (traditionally having a position of power and mystic force). Together, they set the rules for the kamelan n'goni music. 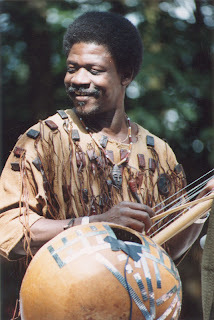 In most cases with Alou playing the kamelan n'goni and Flani singing. In the late 1960s they joined the Ballet National du Mali as musicians and dancers. And in the Ballet they met dancer/djembé player Zani Diabaté. The three decided to start a private orchestra as a sideline to their work with the Ballet, the Djata Band. I certainly will be posting more of Alou's work in future posts. Here is a track from a concert at the 1984 Angoulême festival featuring Alou Fané as the lead vocalist, and with Flani, Zani and Alou demonstrating their dancing skills. I don't know the title of this track, and am almost convinced that this track was never published in any form. Zani Diabaté is a great guitar player. Thanks for this nice video. This post was mostly dedicated to Alou Fané. I just love the way he dances in this video, it's so very much his own thing. After reviewing the album Zani Diabate posted for Moos I think this song is for the track number nine. Fadingna Kouma. I'm afraid I don't agree. It's definitely not Fadingna Kouma. For one thing that song is always sung by Flani. Furthermore Fadingna Kouma is also in the Angoulême concert.